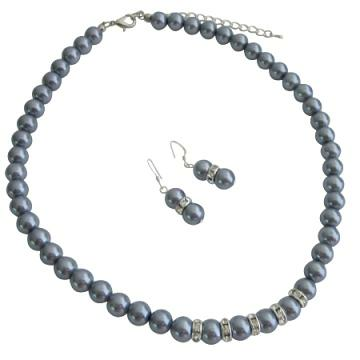 The fashionable jewelry set has gray pearls & silver rondell spacers and sterling earrings 92.5 hook. It will look unique with any type of dress. Buy Gray Pearls Silver Rondells Necklace Earrings Wedding Favor, sold & shipped by Fashion Jewelry For Everyone where you can shop online for Leading Online Retailer for Indian Fashion Jewelry. This Bridal collection has been tagged as pearls, bridal, valentine gift, holiday gift set, party favor, bridesmaids, costume jewelry.